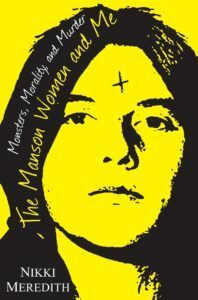 THE MANSON WOMEN AND ME is now out in Paperback. Pick one up wherever books are sold. “Part memoir, part true crime, THE MANSON WOMEN AND ME is a must-read book. By looking back at the Manson crimes and trying to understand how and why Leslie Van Houten and Patricia Krenwinkel fell under the murderous spell of Charles Manson, Nikki Meredith reveals a disturbing reflection of America today.” — Suzy Spencer, New York Times bestselling author of Wasted and Wages of Sin. “Combining a compassionate memoir with meticulous journalism, author Nikki Meredith has produced a thought-provoking meditation on nothing less than the nature of evil. She cares about what causes it, but she doesn’t stop there—once it’s entered a person’s psyche, she asks, can it be banished? Readers of true crime will find much to ponder here.” — Julie Smith, Edgar Award-winning author of the Skip Langdon, Talba Wallis, and Rebecca Schwartz mystery series.